Taylor Made’s P790 iron combines forged construction with new “SpeedFoam” Technology delivering distance and playability with the Look & feel you would expect of a true players iron. Last month at the 2017 WGC-Bridgestone Invitational Jason Day and Jon Rahm were spotted testing out prototype 2 & 3 irons on the range Firestone. The images lead to much speculation about a new driving iron model and given the “P-790″ stamping on the iron, it was assumed the new club would be an addition to TaylorMade’s P-Family, which currently includes TaylorMade’s P-750 Tour Proto and P-770 irons released earlier in 2017. Well this was not the case as today TaylorMade Golf have announced the expansion of its P700-series iron lineup with the addition of the P790 irons, a forged players distance iron engineered with new SpeedFoam Technology for golfers seeking the forged look and feel of a players iron with increased distance, forgiveness and playability. If you look at the current TaylorMade line up the P790 actually makes a lot of sense as there was a gap in the offering between the M series of game improvement irons and P series of player iron. 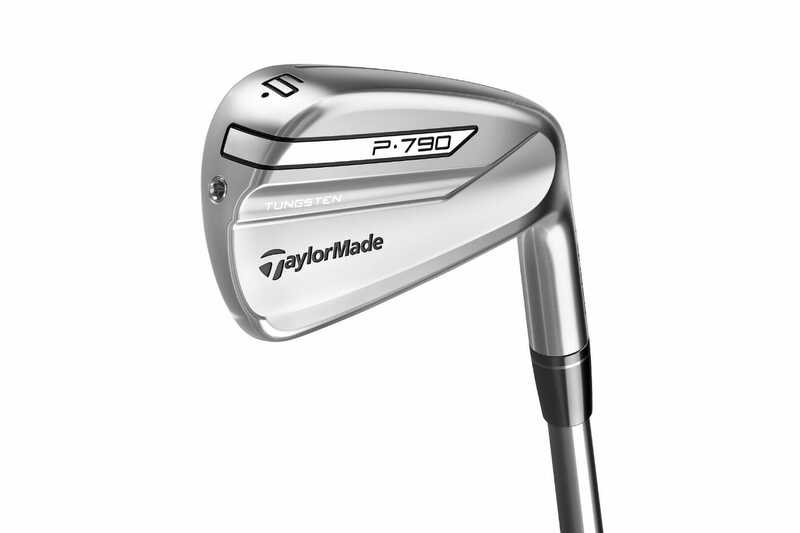 With P790, TaylorMade’s engineers have filled that void by creating a forged iron that delivers distance and playability combined with great feel in a medium-compact head design with a thinner topline and reduced offset preferred by discerning players. This was accomplished by incorporating technologies that improve on feel, sound and consistency while delivering significant distance. The P790 features a soft, 8620 carbon steel body combined with a high-strength forged 4140 carbon steel WrapFace in a hollow body design. 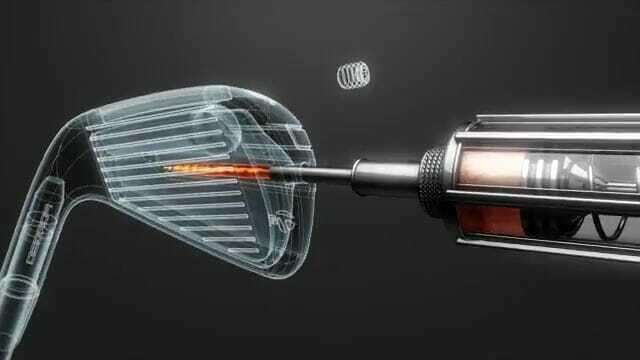 We have seen other companies like PXG use a polymer foam inside the clubhead cavity and TaylorMade have introduced their variation on this into the P790’s using what they call “SpeedFoam Technology”. So what will this do you ask. Well it serves a dual purpose of generating ball speed as well as the management of sound and feel. Injected into the clubhead, SpeedFoam provides the face support and damping properties that make the performance of the P790 unlike any other iron in the TaylorMade family. The incorporation of the WrapFace creates a cut-thru Speed Pocket on the sole with extreme flexibility in the lower part of the clubface; it’s this flexibility which creates greater forgiveness and consistency than is typically seen in a distance iron design. The P790 also features an ultra-thin 1.75mm face thickness with re-engineered Inverted Cone Technology optimised for the slightly smaller face area. Whereas the company’s previous ICT which had a larger, heavier profile, the new, smaller Inverted Cone allows for reduced face thickness at the edges of the face, thus increasing flexibility from heel to toe and low on the clubface, resulting in more ball speed across the entire face. The P790 will be available at retail on 16th October 2017 and offered in 3-PW, AW, SW, equipped with True Temper’s Dynamic Gold 105 steel shafts with an RRP €1,249 for 7 iron sets or UST Mamiya’s Recoil 760/780 ES SmacWrap graphite shaft with an RRP of €1,549 featuring Golf Pride Tour Velvet 360 grips. 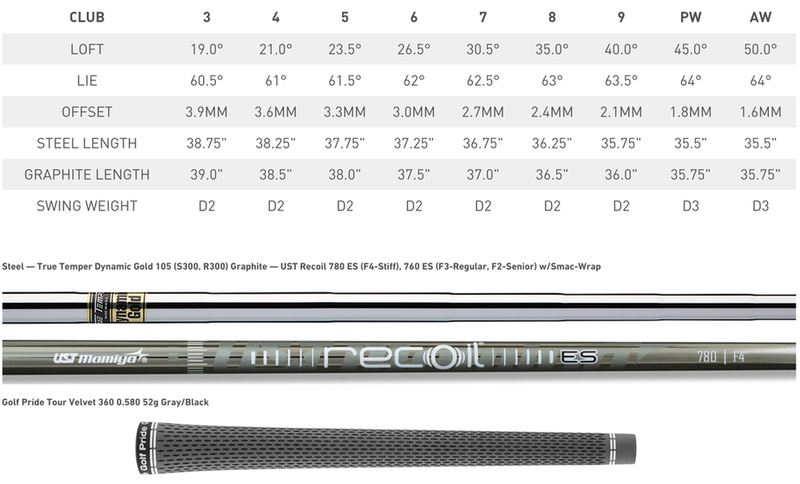 Numerous other custom shaft options are also available.